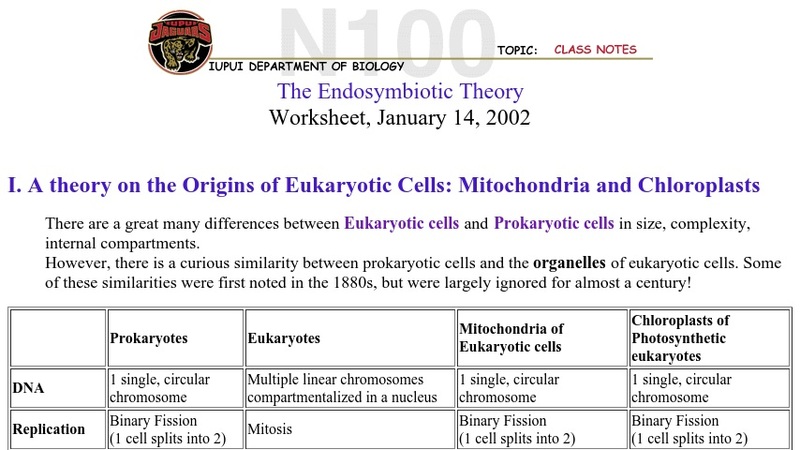 This page contains class notes and follow-up questions about the endosymbiotic theory of eukaryotic origins. The notes cover three main topics - characteristics of prokaryotic cells, eukaryotic cells and organelles; Lynn Margulis' endosymbiotic theory; and evolution of photosynthesis and aerobic metabolism. Students are asked to generate a hypothesis for the origins of mitochondria and chloroplasts, and there are three follow-up questions at the end of the notes. This page was created for an introductory undergraduate course.